While working in the Office of the Dean of Students and seeking programming for graduate students, he found his way to the CIE building. And when he came back to entrepreneurship, he came to stay. 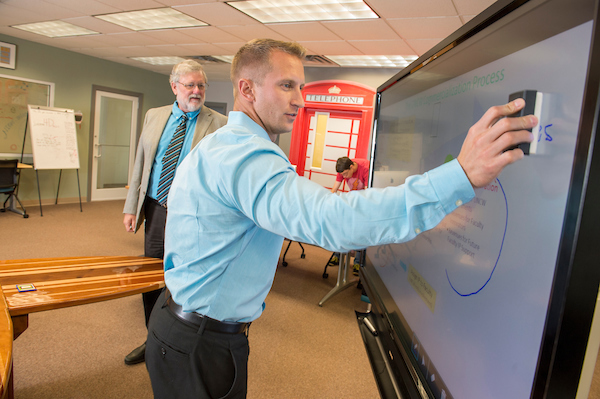 When a graduate assistantship position opened up at the Office of Innovation and Commercialization, or the OIC, Chris applied, and OIC director Dr. Craig Galbraith hired him. A few months later, he was promoted to Interim Manager of the Office. “We're a new office,” Krumm says. Much of his initial work was organizational, transferring paper agreements regarding the university's intellectual property into a database system. Now he also manages the new graduate assistants, communicates with faculty about the processes and procedures for technology transfer, and helps plan the programs that the OIC runs on its own and in tandem with the Center for Innovation and Entrepreneurship. The OIC serves as what most universities would deem a technology transfer office—technology transfer being the process of turning faculty research into patents and commercial products. He adds, “[The OIC is] a technology transfer office, but we're called the Office of Innovation and Commercialization because we encourage innovation in general at the university.” One of the OIC’s unique functions, Krumm notes, is that faculty can choose to commercialize their own research and start companies in the office space that the CIE provides. The OIC participates in numerous CIE programs and performs its own outreach. It was heavily involved in planning the UNCW Hackathon of a few weeks ago. It also administers the Ignite Program, a scholarship of sorts that gives UNCW students with entrepreneurial ventures up to $3,000, office space at the CIE, mentorship, and more to help them get their businesses off the ground. (Previous Ignite Program participants include Leah Sherrill with Special Pedals and Hillary Scott with Greenflare.) Its third large outreach project is the annual Chancellor's High School Innovation and Entrepreneurship Competition, in which high school students submit business plans and rocket pitches and present at the CIE.
One of the things that makes Krumm so good at his job is his own genuine interest in entrepreneurship. Follow us on Facebook, Twitter, and Instagram for more news, updates, and content.